LG Renoir KC910 eventually comes to fight in the class 8 megapixel camera. Samsung, Sony Ericsson and has VirtuV first technology to offer high-resolution camera like this. Scanning LG Renoir reminds us of the product, Viewty. This contention appears due to the existence of the touch screen and lack of key control at Renoir. No one really, Renoir was launched to replace the Viewty, full multimedia, complete with the camera quality is better. Box, a bit broad but still faithful to the proportions of a mobile phone is a little word that can describe the shape of the KC910. Unlike the iPhone 3G or a PDA to a broad side, can still spelled KC910 slim candybar. Almost the entire front section is dominated by the mobile phone screen. The rest, empty area filled by three button and earpiece. The face of the phone by a plastic coated with a hard effect doff. However, the key and the battery cover is plastic, coated glass transparent so impressed slippery and dirty easily. In the battery cover we can see the camera's microphone. Closed with the lens mechanism play. Lens cover is a little difficult to access because it is small. Beside, we also find the flash and the focus indicator. In Renoir KC910, LG using the touch interface as the Viewty and Cookies. Similar appearance to the property of Samsung's TouchWiz interface. Where we can set the widget that appears in the main screen. Start from analog, digital, calendar, music. TFT touch screen with a resolution 262,144 color 240 x 400 pixels (WQVGA) described in the 3 inch diagonal. Wide enough for our fingers acceleration. Feedback resonance method with access to several men, including for sending sms does not make us. Quality screen Renoir can only competed by the iPhone 3G and BlackBerry Storm. LG Renoir has a camera that is good. Resolution camera with a Schneider-Kreuznach label that brought the number reaches 8 megapixel. Can produce images with resolution up to 3264 x 2448 pixels. In superfine quality, the image can reach the size of 1.5 to 2 mb. A number of means to take digital photos are available in the software. Start of autofocus, manual focus, macro mode, white balance. Manual focus is also easily done with just the touch where you want to be a focus on the touch screen. When viewed in the outdoor images, almost all of the image appears focused. Included in the corners that usually begin fading, and the distance from the point of focus. While the use of cameras in the room also so not a problem. Thanks to the presence of type Xenon flash lamp, the light issued able to fill the empty space on the object image. But not too close, the flash light can make the image look too bright. In addition to still images, the camera is also equipped Renoir video recording ability that extraordinary. Codec full, including DivX, MPEG4 will make the camera record video in avi format. Framerate resolution ranging from VGA, WQVA, up to QVGA resolution smaller for mms. Variations in framerate that is divided into 3 normal, slow motion and fast motion. Where for the normal 30 fps, 120 fps for slow motion and 5 fps for fast motion. We can create an interesting video with this option. But the memory space available must be large, because the type of media format such as this are great. In addition to the camera, actual load Renoir many other multimedia features. One is a music player. LG characteristic appearance, which is sorting the files and look good now playing info ID3Tag have supported a more accurate. Quality of output is also not less. LG was first to use Dolby Mobile technology to a more surround sound and vigorous. Unfortunately, the hole for 3.5 mm audio is not available in this phone. Next is a video player. The withdrawal for the record, video player is also capable of displaying video files in avi divx format. Unfortunately not all avi format can be played. Easy condition, just not popular for most mobile phone users. That is the file you want to play should be a mix between the MPEG4 video codec and audio codec aac/mp3. If you use another codec, avi divx is read as a file that does not support. In addition, we can find a video editor, FM radio, java and flash games. Renoir brings 7.2 Mbps HSDPA technology. Business is certain to download the media files or watching streaming media can be done without problems. Another way to access the internet are also available, the Wifi network. 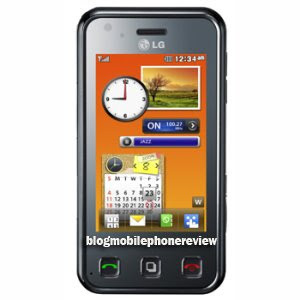 LG can be spelled out is quite complete facilities provide internet connection in the phone. Including a browser that is ready to use with touch user interface. Bluetooth and data cable is also available with a complete profile. you can send files and audio (A2DP) with this type of connection. There are GPS receiver on the phone. You can set the type of reception of satellite information, whether Assisted (A-GPS) or stand alone, only rely on receiver mobile technology without assistance. When default, this GPS can only be used in the camera as a means of geo-Tagging, Google Maps application and a jogging buddy. LG Renoir using battery Lithium Ion 1000 mAh for power supply. Battery power is the power to compensate for the many standard features of the phone. Luckily, LG management have power enough respite. Once in the charging, the phone survived for 1.5 days. LG KC910 Renoir mobile phone is not multimedia best. Although the full-featured, only the camera that adds value of this product. Interface is very good impression caused by touching the screen Renoir. Unfortunately, many lack the browsing and are not friendly with the fingers. That is, we are forced to use the stylus for a more intense, for example browsing the menu and the Internet.